Order the 24m IKAR Fall Arrest Block SRL inertia reel type 3 Rated 136kg/300lbs . 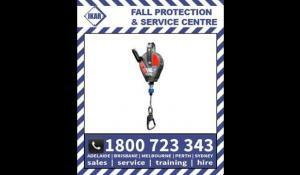 Unbeatable prices on PPE and Height Safety products. This aluminium housed fall arrest block is a sturdy, low maintenance device fitted with a steelrope lifeline, terminated with a steel double action hook. The attachment anchorage point on the fall arrest block is an open steel handle, suitable for connection via a Standard Karabiner type connector, or a Standard Karabiner type connector with an Anchorage Sling, or a Large Karabiner. This fall arrest block also has a built in recovery mechanism, which is engaged by pulling a pin on the side of the block and engaging a winding handle. This then allows the device to be used to lift or lower a casualty post fall, or if they have become incapacitated in a confined space. The lifeline in this fall arrest block has been tested in a simulated fall over an edge and passed the German draft amendment EN360. However, not all edges will react in the same way as the tested steel edge, so when using this fall arrest block, every effort must be made to ensure that in the event of an arrested fall, the lifeline does not pass over an edge. The dimensions of this block are: 630 x 275 x 110 mm.